The small dirty-white „something“ jumps vigorously back and forth and efforts to give his little voice a menacing sound. But the barking is to squeaky. It sounds like in a cartoon for children. The little dog understood his job very well – to protect this land and the house – but from his eyes speaks the pure fear. When I point the camera at him, he flees into the hut without quit barking. The plot is a debris field, the house is not more than a ruin. The little barker protects dead stones – in two respects. The artillery strikes have left their mark. Nobody can live here no more. Actually. Yet there are still more than 30 families who endure here. Most of them are too old to go. But it is not the only reason. All of them simply do not WANT to go. … where there is actually nothing left to „be protected“. 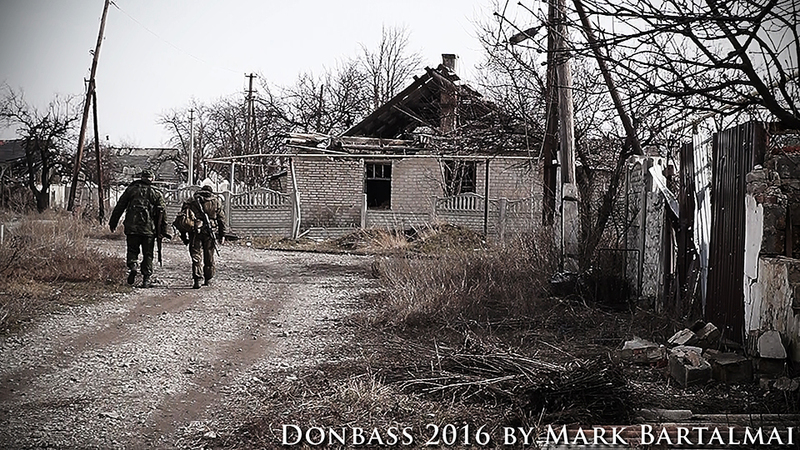 „Here“ – that is the furthest northwest outskirts of Donetsk, just a few minutes walk from Peski. There is tons of heavy artillery of the Ukrainian forces. „Here“ – this is the direct contact line of both sides, next to the skeleton of the airport. „Here“ – that is the end of the world, it seems. 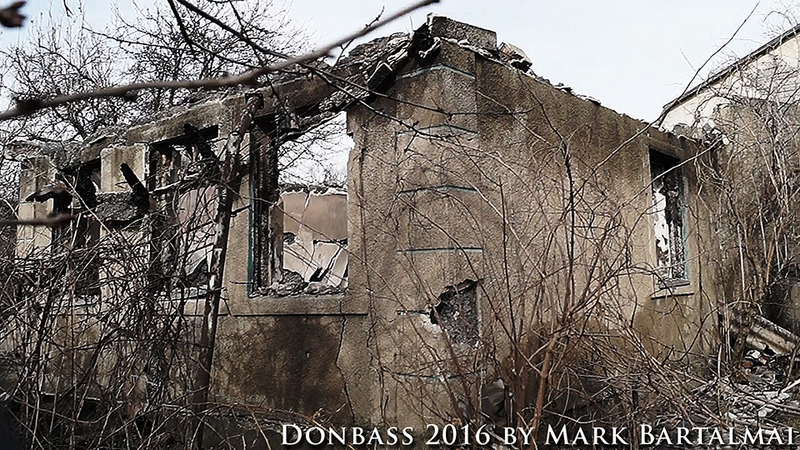 The suburb of Donetsk is called“The Merry settlement“ („Wesjolyj posjolok“ / „Весёлый посёлок“). 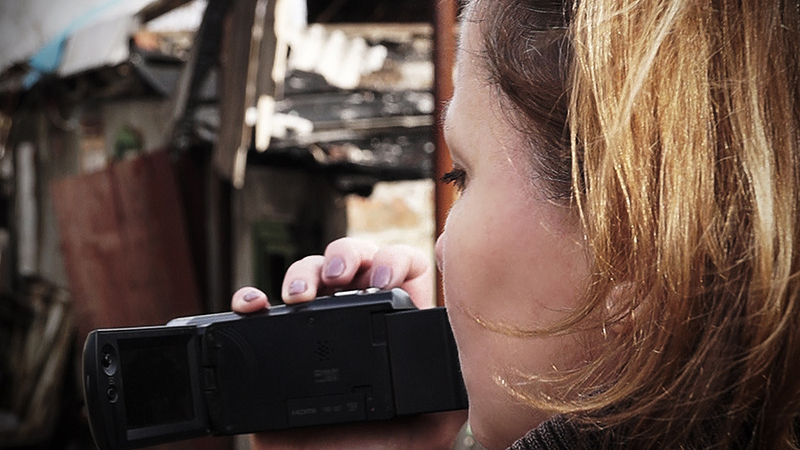 We are here to shoot material for our second film „Frontline City“ about the situation in the Donbass. 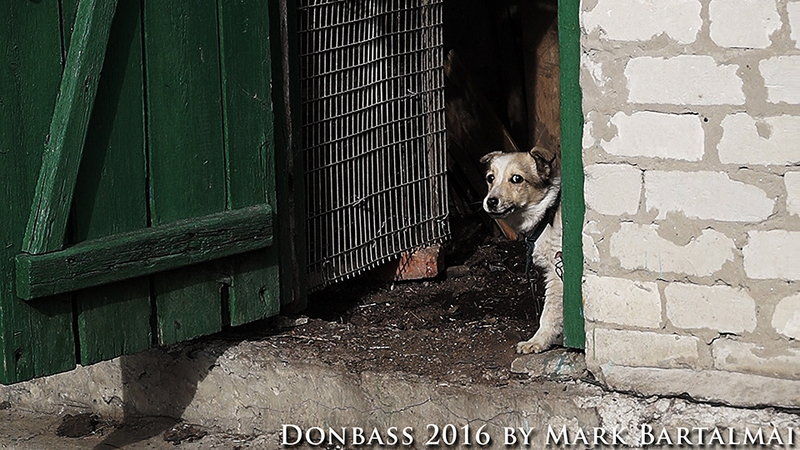 We want to show how people live here – to whom we incidentally actually belong, because we live in Donetsk for the film and photo work. Quite normal, like everyone else. What we find in the „merry settlement“ is everyday life for us, but still not for television audiences and newspaper readers of the Western media. Our first film was subtitled „The concealed war“. There is no house that is not affected. 80% of the houses are uninhabitable and only fit for demolition. Nothing has changed. Since the farce of Minsk II artillery is not a piece of quiet but the media silence is even louder. This war shall not take place in the living rooms and minds of Western civilization, where their governments continue to support the long since failed rulers in Kiev with russophobic drumroll and especially with money. Money that ends up to a considerable extent on offshore accounts of Kievan rulers and the yet undisturbed acting Ukrainian oligarchs or is put precisely in this war against its own people. Those people, that they absurdly left without wages, pensions, food by Kiev – but therefor „sending“ grenades – but they claim that it is part of Ukraine. Or is it but only about the territory and not the people? Full economic blockade. The only thing that Kiev sends, are troops and grenades. Our flak jackets lie comfortably in the trunk. We have not tightened them. Too long we’ve been in these circumstances, to uncomfortable the heavy pieces. We shoot our material in the „merry village“ and make our discoveries – awaited and astonishing. In a field on a picturesque pond I try unsuccessfully to talk a comment. When we stumble back to the dirt road in front of the houses through the late winter mud, a vehicle stops. The driver cranking down the window, a friendly greeting and noted: „I just wanted to say, could be landmines there. Have a nice day.“. Well, good to know. The woman who lives on one of the destroyed plots is called Vita. Into the house she no longer goes. She „lives“ next to it in a kind of shelter. It is a former stable whose roof is covered with a holey blue tarpaulin. It stands out in the wind from the charred support beams. „I live but just here,“ she says. The only thing she still uses at the house is the cellar. When the bombardment is too close. A white car stops. Two men get out and we ask, what they are doing here. „Distribute bread,“ is the answer. They are two retirees from the area who regularly take bread from the humanitarian aid center and distribute it among the remaining residents of the settlement, who can not take the long distance to the city. Several times a week they make this „bread tour“. Voluntary and unpaid. They even live within sight of the Ukrainian positions at the edge to Peski. We accompany them a bit on their tour and they tell us how life is here like that. They and their families draw a picture of the situation, which brings to fore the amount of contrast between horror and joy. We continue walking by foot. The previous silence of the day is torn apart by an explosion. Artillery. I regret for a moment that the flak jackets are in the trunk. But the people here with whom we speak, have no bulletproof vests either. After the explosion, then silence again. Some of these strikes made it „often difficult to hang laundry“ for an elderly woman in the past. The blast hurled her through her garden. More than once, she tells us. We ask, where her family is. „My children are in Kiev, but I would not go there. The apartment is too small, as we all would not have space,“ she replies. Her pragmatism beyond politics and ideologies is disarming. The war seems to have pleased at this location. The war just does not want to leave here. The area in which we move is persistently under attack since the war began. The front line is here since almost 2 years. The „merry village“ is a mere shadow. There is no house that is not affected. 80% of the houses are uninhabitable and only fit for demolition. Even before places with special meaning is not taken hold. Although we are faced with the question of whether there could be more valuable and are less valuable places in the destruction of life and land. But sometimes it makes us shudder stronger. „You have become beautiful, girl. I know you yet, since you were a little child.“, he says. The „bread tour“ stops at another demolished house on the street. An old man stands in front of it and takes his ration. He looks at my companion Nelja and says: „You have become beautiful, girl. I know you yet, since you were a little child.“. It is the blurring of borders between memory and imagination. 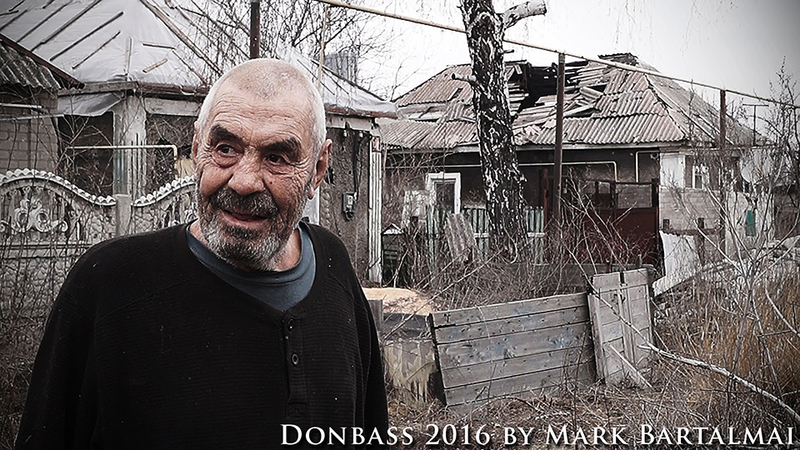 People can not imagine that someone outside the Donbass cares about them. They are cut off from the rest of the world and their only regular visit – the two retirees from the neighborhood on their „bread tour“. Journalists, even Western, were never here and will not come here. Nelja smiles embarrassed. She comes from St. Petersburg, not from Donetsk. Especially not from this „merry settlement“. 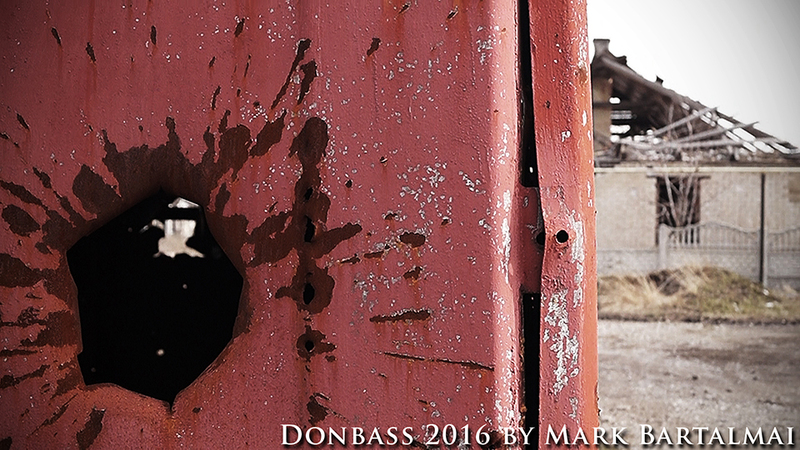 As we return to Donetsk in the evening, behind us the cannonade starts. The bombardment is again heavier than in recent days. In our network, the reports of the impacts along the entire frontline overturn. Yes, the war seems to have pleased at this location. The war just does not want to leave here.